SHAFAQNA – For months, Salem al-Ajla, 65, has kept a lonely vigil outside the twisted heap of concrete that was once his home. One day, he hopes workers will arrive to help him to rebuild it.Before the seven-week conflict in Gaza this summer he lived in a three-storey apartment block that housed five of his six children. The building was completely destroyed by Israeli shelling, like all of the others on the street. Now he spends his days waiting outside, in a shack made of corrugated metal sheets, the air inside heavy with acrid smoke from a charcoal heater. A cold wind whips through the open doorway; the ground is damp from days of heavy rain. The coffee he offers tastes faintly of sewage, a testament to Gaza’s crumbling infrastructure. 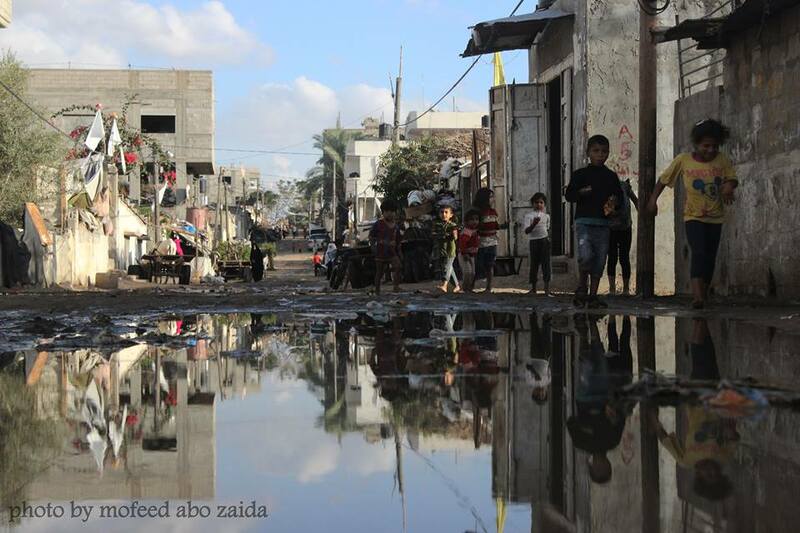 Nearly four months after the latest war with Israel ended, almost nothing in Gaza has been rebuilt. Donors have pledged $5 billion (£3.2 billion), and Israel reached an agreement with the UN on allowing supplies to reach the area, but restrictions remain tight. Of the five million tonnes of materials required to rebuild, just one per cent has arrived. About 40,000 people still live in temporary shelters, and countless others in the ruins of their houses. There have been some modest repairs to infrastructure since the ceasefire: power plants and sewage facilities have been mostly fixed. A Qatar-funded project to renovate Gaza’s two main highways has resumed, but the housing crisis remains unaddressed. A total of 18,000 Gazan homes were destroyed by Israeli bombardment; the Jewish state’s response to rocket fire from Hamas militants aimed at Israeli towns, and the Islamist attack tunnels dug under the Israeli border. Another 50,000 homes were damaged. Workers have barely started to clear the rubble, let alone rebuild, and the residents of Shujaiya have received little from the government beyond basic items such as mattresses. The border between Egypt and Gaza has been largely sealed since the war, as the Egyptian government, like that of Israel, tries to stop Hamas smuggling in weapons. The closure is forcing Palestinians to import all of their supplies via one crossing with Israel. Israel fears that Hamas will use the materials to build weapons and military tunnels, so the mechanism agreed with the UN allows them to vet all of the contractors in Gaza, and requires video surveillance of construction materials. The restrictions mean that private contractors have received almost nothing, according to Gisha; their only source of cement is the black market, where it sells for £30 a bag, more than seven times the regular price. The work here is being overseen by the West Bank-based Palestinian Authority, which has, nominally, governed the Gaza Strip since June, when Hamas agreed to cede power to a new unity government. The prime minister, Rami Hamdallah, has made only one visit to Gaza, and many believe he wants to drag out the reconstruction to weaken Hamas, the bitter rival of his own Fatah faction. “In any country in the world, if a plane or train crashes, the president goes to check on his people. We had a war, and until now Mahmoud Abbas [the president] hasn’t come to Gaza,” says Mouin Abu Aqla, one of those who lost their homes. Neither optimism nor threats offer much consolation to Mr al-Ajla. One of his sons, a member of Hamas’s armed wing, was killed during the war and he fears another round will bring further misery. He calls the promises of reconstruction “empty” words. December 13, 2014 in Palestine.